Dr. Diana Bishop is a visiting scholar at Oxford. As a historian of science, her research focuses on sixteenth-century alchemists. She spends her days in the university library, translating ancient illuminated manuscripts. She’s also a witch, descended from a powerful family burned in Salem, but avoids using any magic. One day she calls a rare manuscript from the stacks and recognizes its magic but quickly sends it back. The entire paranormal community starts hounding her, and she learns that the manuscript has been thought lost for over a century. Allegedly the manuscript reveals the origins of the four races on this planet: magical witches; cool, ageless, predatory vampires; artistic, mad daemons; and blissfully unaware humans. One paranormal creature who is drawn to her is Dr. Matthew Clairmont: brilliant scientist, wine connoisseur, and gorgeous vampire. They fight over library space and bicker their way into falling in love. 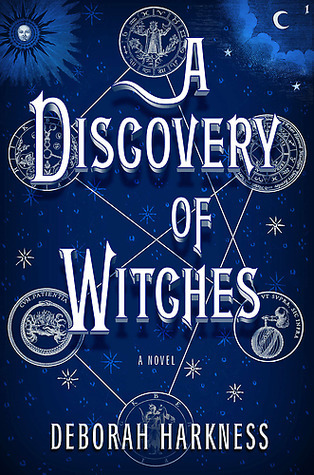 He does what he can to protect her, but fellow witches and vampires close in, intent on probing Diana’s magical abilities and her connection to the lost manuscript. The story is exciting, with twists and turns, violence and romance. Deborah Harkness, a historian herself, successfully weaves together alchemy, witchcraft, evolution, mitochondrial DNA, wolf behavior, mythology, religion and history. The settings are beautifully described, from the libraries and boathouses of Oxford to the magical Bishop home in New England, and the descriptions of tea, wine, and English breakfasts (piled high with toast, eggs, sausage and fried tomatoes) are crave-inducing. Most of the chapters are written in first person, from Diana’s point of view, but a few chapters are in third person, following other characters, primarily Matthew. Normally, when authors switch between first- and third-person it drives me nuts, but in this case I loved the story and characters so much that I am willing to overlook the point of view changes! My only complaint is that the novel is the first of a trilogy so I must wait to find out what happens next.